Jessamyn releases new EP ‘Songs of the Living’ | Sonic Smash-Music! 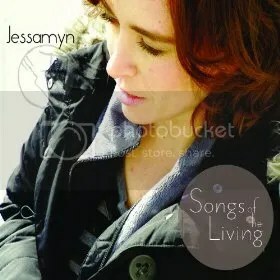 The singer and songwriter known as Jessamyn has released her latest EP album, “Songs of the Living.” The record is composed of six original tracks for an approximate total listening time of 20 minutes. It has been released on the Golden Hammer Records music label. It is her most significant official release since her 2012 collaboration LP, “Ghost and Door Party.” A bright, uplifting collection of contemporary folk rock music from one of the best-kept secrets in the genre, “Songs of the Living” stands as evidence that Jessamyn has plenty of sonic heart and soul to go around. Jessamyn cites as main artistic influences the Beatles, Joni Mitchell, Tori Amos, Iris Dement, and Rich Mullins. Of these, her vocal timber most resembles a cross between Mitchell and Amos, while her songwriting resonates with the classic patterns of Dement. Her rhythms groove mildly and pleasantly, with more swing than Iris Dement but less aggression than the edgier work of the others. The result is a unique, gentle tone and writing style which is Jessamyn’s own. Jessamyn’s first foray into music was as a drummer, which she began at seven years old. She played for bands throughout her high school career, picking up piano and guitar along the way. Her collaboration with singer-songwriter, guitarist and priest, Fr. Charles Klamut, has been described as existential alt-folk music. The “Songs of the Living” EP by Jessamyn is available online worldwide. Get in early. This entry was tagged jessamyn, jessamyn luong, mondotunes, music, songs of the living.